This is true if you are a good shot. This is also what you want pup to learn. Once he relates the shotgun blast to the resulting bird - he will look forward to every time you pick up the shotgun. If you are like me, bang means maybe a bird will fall, more likely it is that pup will hear me say, "No bird." That is a subject for anther lesson. My dogs do learn that there is almost always a bird following the shot when we compete in retriever hunt tests. Dove and duck seasons are in full swing. Upland game abounds. 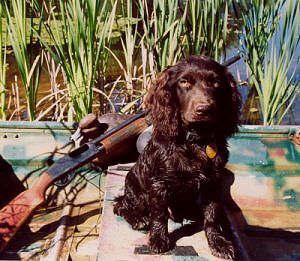 You and your new pup will be experiencing your first season of bird hunting together. This is an exciting time. The anticipation of birds zipping through the field sometimes means that pup is forgotten. Guns are blasting all over the field. What is pup doing? Is he ignoring the guns or has he high-tailed it back to the truck looking for peace and quiet? You must introduce the pup to gunfire carefully. A birdy pup won't do you much good if he bolts at the blast of a shotgun. The easiest way to get pup used to commotion is to make normal noises around the house. Just as with children, don't treat pup with kid gloves. When you are in the kitchen, bang those pots and pans and if pup startles, don't make a fuss over him. Stop making noise and ignore him. When he settles down, make some more noise, just not as loud. He'll learn that the noise won't hurt him. Let doors slam shut, drop books on the floor, play rock 'n roll on the stereo, watch old war or cowboy movies (with the volume turned up loud) that has lots of bang, bang, shoot em' up action. If pup is being raised in the kennel you can still use the same principals. Bang the feed bowls together and drop a bowl every now and then. If you train nearby, shoot around the kennel, yet stay far enough away so pup isn't spooked. If you can't see the dog, then have someone keep an eye on pup (where pup can't see him) to check the pup's reaction when you shoot. I have a fenced-in turn out area where I can let several pups out at a time. I work one pup with birds and a blank pistol close enough where the other pups can watch through the fence (about 30 or 40 yards away). They can see me toss a bird and the blank pistol shot follows. They see the excitement of the chase and the praise lavished on the working puppy. The birdy pups inside will hog the fence trying to get out to play. The shy pups are free to run and as they learn the noise won't hurt them, they will move closer to see what they are missing. "As pup relates "bang" to bird, he will get excited about the gun and start looking for the bird." The chain gang method uses the same principal. Use dog tie-down posts and attach a two-foot chain and snap to each post. Space pups far enough apart so they don't get tangled in each other's chains.